Few months ago I started an organic garden in my tiny backyard,combining/experimenting with SFG gardening & permacultural principles. Made 3 raised beds, and planted aromatics herbs, spices, medicinals, veggies as well as many ornamental...soon I started to think in adding a few chickens to get some organic eggs too... and that's how i get to find BackYardChickens.Com... and fall in love with the coop designs and get addicted to BYC ! Since then I started to play in my mind with the idea, more than that to get obsessed with the possibility...So after hours and hours of browsing the site I started (inspired by many wonderful coops here) to actually create some plans for a 3'x4' coop using simple drawing tools from PowerPoint. 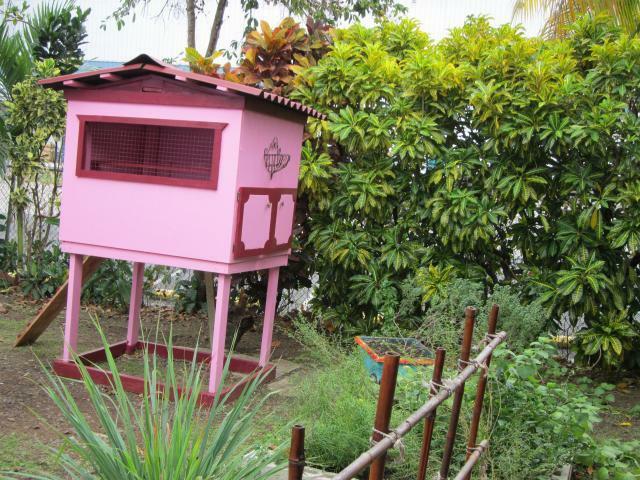 Villa Gallina is a 3’x4’ - 2 nests coop , with an attached PVC run 9’x3’x 4.5’ designed to use in a tropical environment in a suburban small backyard. There are not many predators, God forbid a burglar that jump the fence or a stray dog. Safe enough to protect them from “Guaraguaos” a local pray bird from the family of hawks as well as dogs. It will host an initial family of 3 birds (1 rooster & 2 hens) but in theory may house up to 7 hens (giving more than 2 square feet per chicken in the run & 11“ each space in the roost inside the coop. Its made out mostly of new treated wood panels and 2”x4”, semi-industrial linoleum tiles, asphaltic zinc, 1”x1” metallic wire & an attached ¾”PVC tubing and green plastic chicken wire run. We also re-design and adapt the original plan in order to save some money and re-purpose 4 good quality mahogany doors, laminated with Formica in the exterior side, savage from our old kitchen cabinets. Also the door the in the run under the coop was a re-purpose canvas stretcher (18 years old) made out of good quality wood 1”x4”. as you see if we add the blue spaces we can add 3 more chickens... humm...ok thats going a little too far I guess! Gathered the materials, buying little by little and searching for good materials to reuse. Finally spent my Christmas vacation building it. 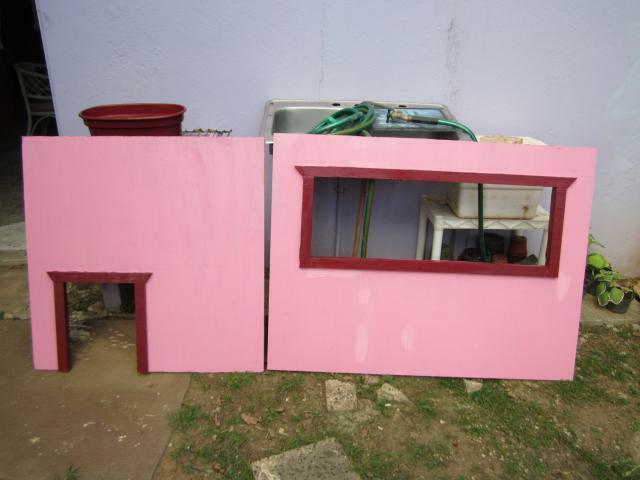 Is the first time I build something, but armed with a power-drill, a jigsaw, a hammer, measuring tape and a square; started what my husband called the "Chicken Villa Project", and which end up at Villa Gallina. First I cut & assemble 2 pieces -3'x3'x1/2" (walls; one with the chickens door, another with the opening that give access to the nests) 2 pieces- 3'x4'x3/4" (one with a window opening 12"x36",and the floor. With some left overs built a 3'x4'wall with an opening door for give access to human for cleaning). I decided to paint before assembling, so later we only need to retouch, and so far has been the best idea. The roost also need to be fix, the latches to close the doors, a flower pot will be attached under the window, and plants will be put in the flower pot over the nests doors; some trimming here & there for aesthetic reasons, work the landscape around the coop & bring the chickens in (considering to buy from a friend 3 hens & and 1 rooster, almost a year old, already laying)... I'll keep updating. Blessings! Today 1/15/2012, 3:30 pm...just finish the 3'x9'x4.5' PVC run frame... only need to cover in wire, level the dirt floor, add wire doors to the area under the coop and we will be ready to bring in the chickens!!! Last minute finishing touches with my husband's help & the Chickens are here!!! I decorate a pot & put a smaller one inside with a cute flowering plant, my husband installed it to the front wall. My hobi decided we may need electricity in the coop and make it happened! We add gravel inside & outside around the run. Probably we will put some concrete blocks (like we do for the rised beds) around it. Called it finished at 5pm and of we went to get the chickens! 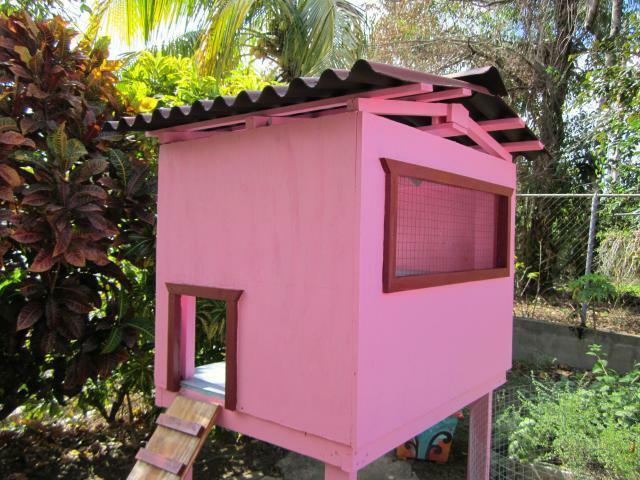 Hope this page serve as inspiration & may be of help to anyone planning on made a small coop as so many cute & functional coops in BYC inspire me & help me to design and built our little "Villa Gallina". This weekend God willing will be adding some roofing to the run... is raining almost daily & i want them to be more comfort... probably will add some sand in the run under the coop too... pics soon! Just add 2 bags of coarse sand under the coop where they have fresh water (change it twice a day) & food (30% protein mixed with layer's pellets). Greens,fruits,veggies scraps, lentil sprouts, crackled corn, oatmeal, yogurt,sunflower seeds are some of the goodies that are served sparingly/randomly on a daily basis. Latest improvement, a door was finally added making possible to a human to get inside the run. Is not the fancier door, just a pvc rectangular frame covered with chicken wire & attached by plastic straps, as a closing device I'm using and elastic band with hooks on each end. Making a slant top part for the nest is not practical if some part of the roost will be above it. The roost indeed should be of a piece of wood, 1"x3" (specially if your chickens are big. The roost was substituted months ago for a wider one (1"x3" ) and today I modified the nests, leaving only the side the girls use hopefully, now the top part of the set don't get full of poop! I just built a small housing for a couple of Kikirikis check it out! Villa Gallina will have baby chicks soon , or little Yamina is Broody! Unfortunately, Yamina's broodiness was a fail, one day I came back from work & found out she get of her area, and wasn't able to get back to her eggs it until I get there, the eggs were cold ... but I let her finish the broodiness period with her but seems like she was too may hours outside & the eggs get spoiled... It was kind of sad, but she recovered pretty soon. Home Improvements in Villa Gallina! Four years ago I started the adventure of chicken husbandry, starting with the construction of Villa Gallina. The tiny coop has suffer some changes since as well as it occupants has change, non of it original residents still alive; actually, the rooster is Favio, a handsome black cooper maran, Yamina, a mutt with some black star among her genes, that lays small cream eggs, Karaya a longhorn/ eastern egger that lays big blue eggs, Raphaelle a lovely red layer who is the youngest and lays big brown eggs. Villa Gallina "housing" has change quite a bit. The most recent improvement was actually making its run smaller ( instead of 9'long x 3'wide x 4.5'long is 8'x 3'x4' ) now that the chickens spent most of the time free range in the backyard they dont need as much space in the run. I substitute the old plastic "chicken wire" for metal 1"x1" wire, and change de "human door" to the front. I add a swing for their amusement. Yamina get broody again, and of course the other girls just want to keep laying in their common nest. (Originally the coop has 2 nest but they always used the same, so i decided to eliminate one.) The solution I found was making a broody room for Yamina in the run. Its an enclosure 33"x22" with feed & water containers, and a roomy nest made re-purposing and old PC monitor carcase. The floor is made of PVC 1in panel , the front wall is a 1/4 in x 1/4in attached to a 1in PVC tube frame, the door opening was cut out to fit the cover of a cat litter 5 gallon bucket and the three outer walls are cover with a blue inexpensive awning. This little guy is a rescued pigeon chick that fall of the nest and I found him wondering hungry in a parking lot 4 weeks ago, he still a baby that needs to be fed by hand and can not fly yet. And Today, 4/27/2015 Yamina have her first two baby chicks!!! Turn out, that Yamina is a very good mama hen, she stay in her "maternity room " until her last egg hatched on May. A total of 7 chicks of different ages... only one died on day 2. So she got to rise 6 chicks, 2 boys and 4 girls. I give away 2 girls and a boy, and keep 1 boys and 2 girls. With 8 adult chickens, its obvious the run is too little to leave them there 24/7... so I decided to leave them freerange in the backyard from 7 am to 7 pm.... not a good idea... they eat and scratch most of my veggie/ herbs/ ornamental plants and dig holes everywhere, not to mention the chicken poo all over the backyard. Our island was devastated. We still have most of the country without electricity, cumunications and or water service. Many people lost partially or totally their homes due to the winds and or the floods. Agriculture suffer great losses. Many roads were damaged, and entire cities specially in the mointains got incomunicated. Many people died as an aftermath due to the imposibility of getting the medical treatment on time for preexisting conditions or new sickness. Its been a painfull process for all. But I am very grateful because on our home we were 43 days without electricity and internet, 20 days without running water and a big tree from my neighbor's fall exactly on my tiny chicken coop and run but other than that we are fine. Now we are planing on reconstruct Villa Gallina, make the coop it a little bigger 4x4 insted of 4x3 , plus add a nest box outside in order to increase the sleeping space of my flock of 9 hens and 1 rooster. Soon2BChixMom, Bogtown Chick, 3-Bearss and 3 others like this. Serviceable, Able to expand, change, as needed. Your coop started as a good idea, continues in Real Life. I am so Sorry we have such a %^#[email protected]#@ as President after PR was so Traumatized from Weather.. I, YOU ARE TOO KIND! 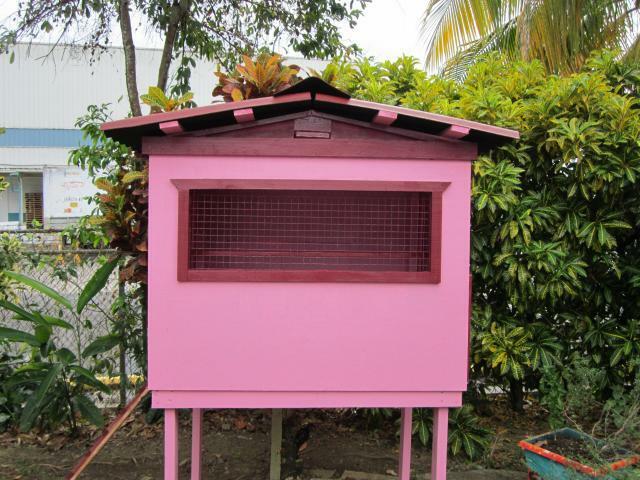 Judy I was wondering about you and your pink coop on PR. Definitely in my thoughts and prayers. You are a survivor and obviously resourceful. First one to ever comment on my coop here on BYC... so I always remember you. Merry Christmas. judyki2004 and black_dove2 like this. Aww so sweet of you! What a nice surprise to just find this message! Thank You so much it made my day! 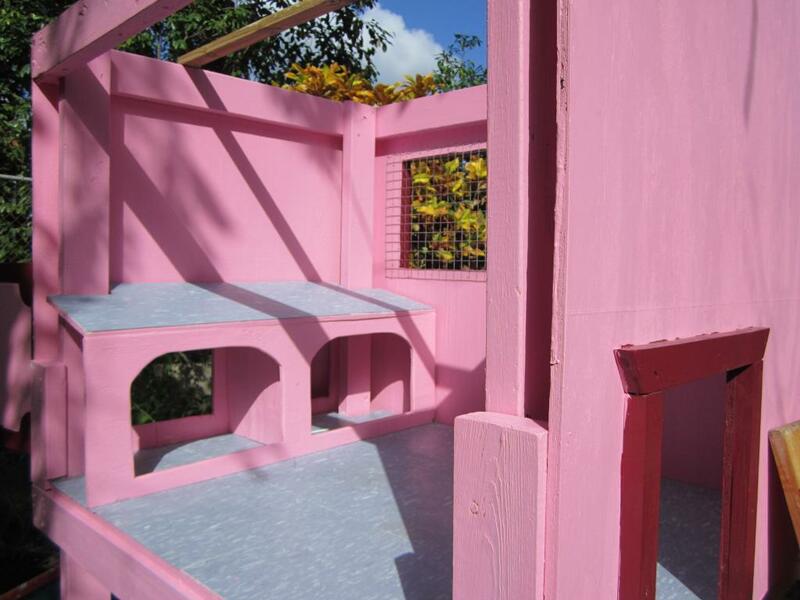 As you see after the hurricane, reconstruction was mandatory, so doing so we must upgrade. Now the coop is bigger and the run is neater, all around more practical. Maybe it lost part of its charm but I'm please with the results. Wishing you a Happy & Blessed New Year! I love your darling little coop. I hope to have 4 chickens soon too. Are they ok with mixed sexes? I mean, roosters and pullets together? That the females aren't being harrassed by the roosters too much? black_dove2 and judyki2004 like this. This is so insanely cute! I love your coop! Well done! Have you figured out how to keep the rain out when you have a storm? After you visited my coop page, I just had to have a look at your coop. The first thing that caught my eye, was how lovely a place it is that you live in. It looks so warm and dry, not like me here in Wales, which is mostly wet and cold, with a cold sea breeze. Your coop is really lovely, although I think should remove the cat You sound as though you have had a great time with your chooks, I hope it is the same for me. Love the coop and the colors are awesome! 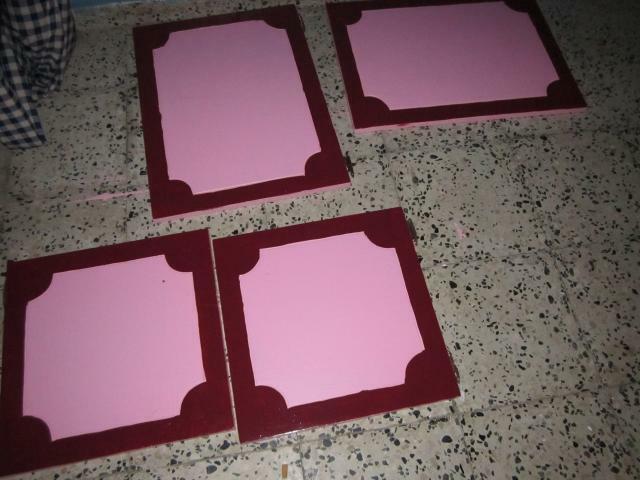 Very beautiful job...Love the pink color!!! 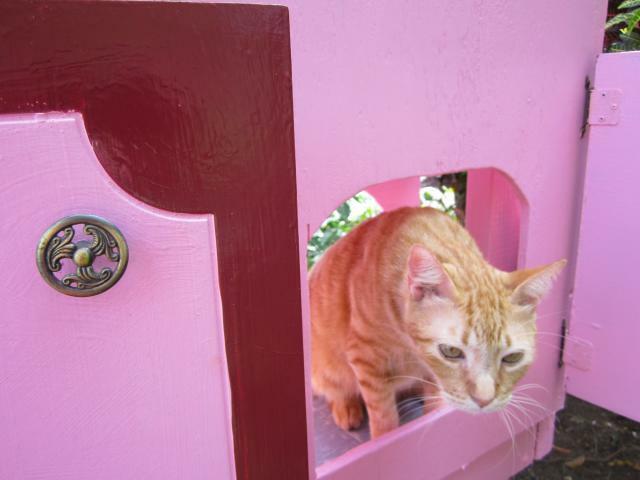 I love your coop- pretty in pink. Seems like roosters is not a problem for people where you live. I hope it'll we the same here as my rooster crows!! Thanks! This helps me a lot in planning my coop for 6! Love this coop and run! The pvc pipes seem like a great idea. How has everything been holding up? Well Done!!! Thank you for sharing your journey! Judy: Your coop is darling. I love it. The colors are so Caribbean, too. BTW, my husband and I love Puerto Rico...have had a few flight layovers there. Gorgeous Island. Beautiful coop! I love the festive paint job and the wire flower baskets. Wonderful! Southern Oregonihens Thanks for the advice! Probably we will double the run size as we hope to ad at least 2 more hens. For now they look quite happy in the space they have, unless a freerange neigbor's roo come close to the run to try figh our roo. I would love to let them out but I just get them & dont want to risk them getting hurt by a big free-range/wild flock -lead by 3 roosters- that roam the neighborhood or even decide to join them. This is sooo nice, thanks for sharing. Thanks for the feedback fc ! What software did you use for you plans you posted? Supposedly treated wood means chickens/eggs aren't organic, but what is expected, allow termites by using untreated wood? 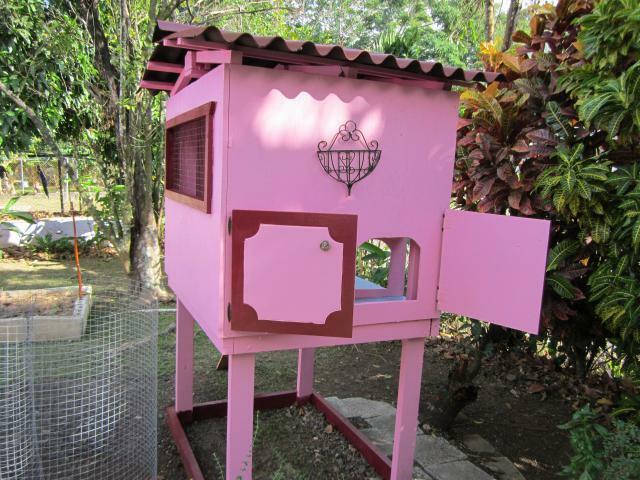 Thank you so much for posting the photos & plans of your coop!! The measurement-labeled plans from several views plus the photos of so many aspects were excellent for helping understand exactly how you laid things out. This has helped me IMMENSELY in planning a sleeping quarters box for 3 chickens within our semi-enclosed run. 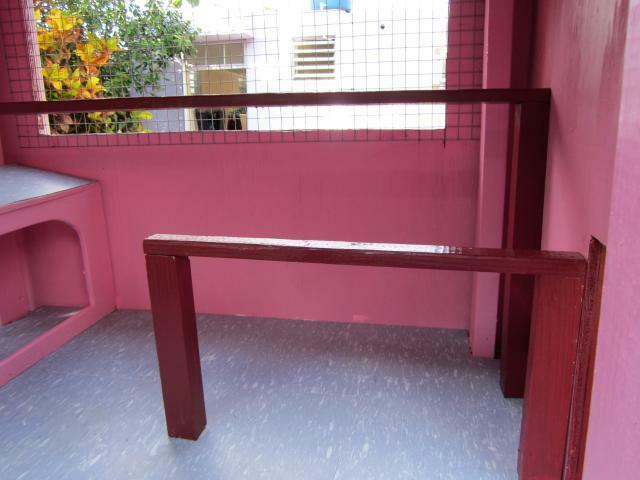 It is very hard to find info on small spaces like this, & on head room needed above perches. I also really appreciated the additional explanations on the thread you posted on at http://www.backyardchickens.com/t/77274/dimension-questions . One modification I'd suggest would be on perch shape. 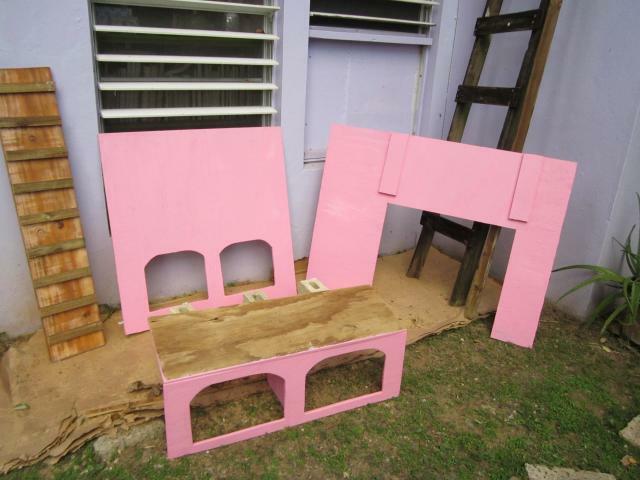 Best perch specs are something not commonly known—I might add a page on it on my website sometime... For large chickens, perches 4 inches wide, unpainted & with slightly rounded edges are optimal. That way the chickens can rest on their feet better (not have to teeter & grasp as much), and--VERY importantly--their bellies & feathers can warmly cover all of their feet when they're sitting during winter. Thanks you again for answering questions I'd really been wondering about for my project. I know that takes a lot of time to put together such clear explanations—Thank you! What an awesome coop! Love the colors and design! Great job. Very nice! Love the chicken calculations. Do you ever have any problems with roosting on top of your nest box?